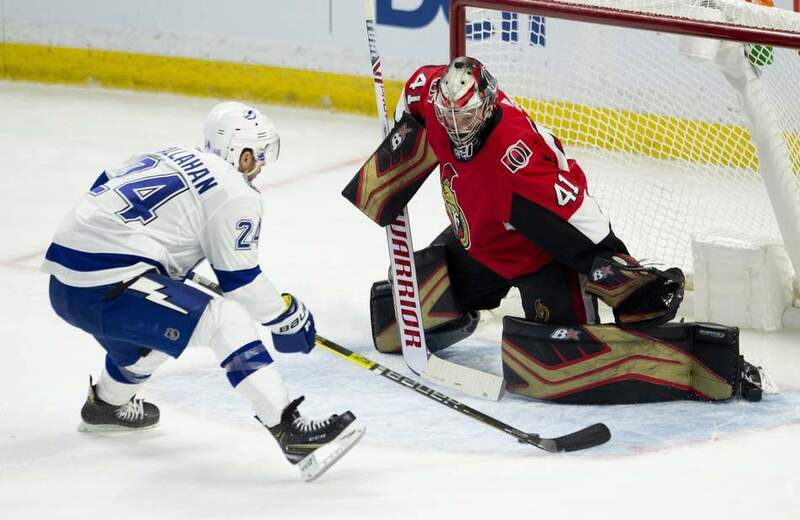 TAMPA — The Ottawa Senators scored four goals in the third period to rally for a 6-4 win against the Tampa Bay Lightning at Amalie Arena on Saturday. The Senators trailed 4-2 before Brady Tkachuk, Colin White, Ryan Dzingel and Mark Stone scored four straight goals. Craig Anderson made 24 saves for Ottawa (7-7-3), which is 2-1-1 in its past four games. Victor Hedman scored in his first game back from a lower-body injury, Mathieu Joseph scored two goals, and Alex Killorn had two assists for the Lightning (12-4-1), who had won four straight. Andrei Vasilevskiy made 28 saves. Tkachuk was credited with the goal that got Ottawa to within 4-3 50 seconds into the third when Tampa Bay defenseman Dan Girardi tried to clear the puck off the goal line but instead banked it in off Vasilevskiy. White tied it 4-4 with a power-play goal at 8:41. He tipped Tkachuk’s redirection of a wrist shot from the point by Bobby Ryan, who had a goal and two assists. Dzingel put the Senators ahead 5-4 with a wrist shot at 10:30, and Stone made it 6-4 with 12 seconds remaining. Joseph scored at 8:49 of the first period to get the Lightning to within 2-1. Hedman beat Anderson from the slot to tie it 2-2 39 seconds into the second. Braydon Coburn scored at 9:15 to make it 3-2, and Joseph scored his second of the game at 14:32 to give the Lightning a 4-2 lead. Duchene gave the Senators a 1-0 lead on a wraparound goal 4:58 into the game. Ryan scored on the rebound of a Cody Ceci shot at 7:21 of the first to make it 2-0. Lightning defenseman Anton Stralman and forward Adam Erne each missed the game with an upper-body injury and is day to day. … The Senators played seven defensemen and 11 forwards. … It was Tampa Bay’s first loss against an Eastern Conference team this season (8-1-0). … The Senators played the 1,000th road game in their history. They have won 413. … Stone has three goals and nine assists in a six-game point streak.